JEFFHEAD.COM - How do the US Navy Littotal Combats Ship (LCS) compare to Peer Opponents? 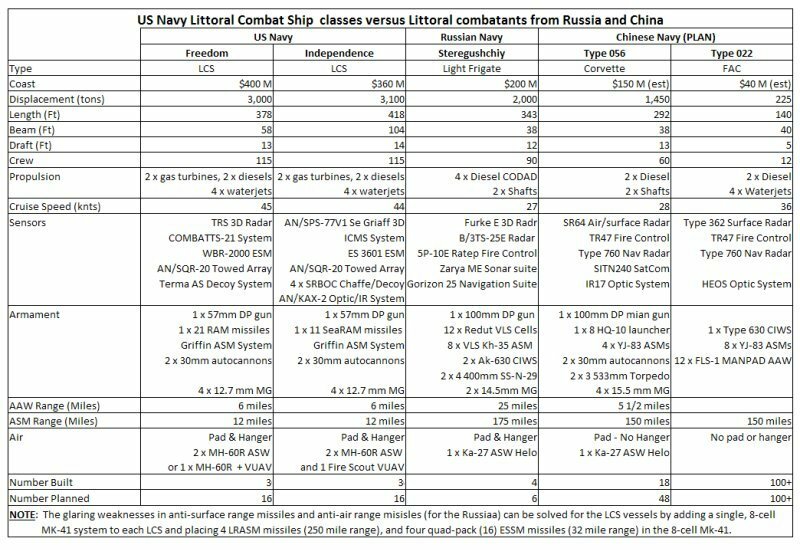 How do the new US Navy Littoral Combat Ships (LCS) stack up against their most likely peer opponents in the Littorals? The answer to this question is something that every US Navy enthusiast, supporter, and verteran should take keen interest in. Over the last several years, the US Navy has embarked on a major, frigate-sized vessel construction program to produce the new LCS (Littoral Combat Ship) vessels for the US Navy. During the competition phase, a build-off between the two competing designs was held. This was between Lockheed Martin (who teamed with Marinette Marine), and General Dynamics (who teamed with Austal). Their respective designs were significanly different. 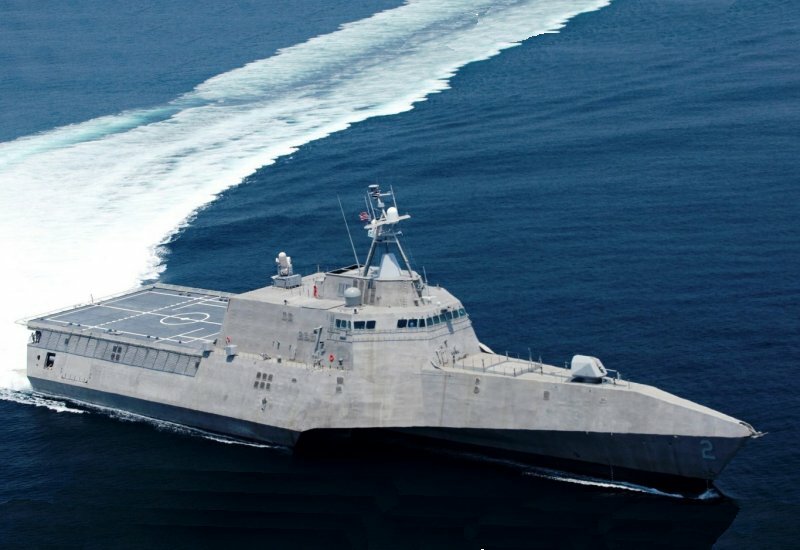 Lockheed Martin built the USS Freedom (LCS 1), which is a steel, semi-planing monohull design, while General Dynamics built the USS Independence (LCS-2), which is an aluminum, trimaren hull design. Both hull forms and design bring different advanatages to the fore. The Freedom is a more traditional semi-planing monohull, with a shallow draft, very high speed capabilities, and has a flight deck that is 1 1/2 times larger than the current flight deck on the much larger Arleigh Burke class destroyer. The Independence trimaren features a very narrow bow, but a very wide main body that is very stable in higher sea states, has a flight deck that is three times larger than the current Arleigh Burke destroyer landing pad, has a very large hanger, a lot of mission module space, and still maintains fast speed and a shallow draft, though not as shallow as the Freedom. After both vessesl were built and trialed, the US Navy made the unusual, and somewhat controversial decision to go with both designs so that they could get the advanatges of both vessels. Originally 56 vessles were planned...twenty eight of each, but in 2013 it was announced that this number would be cut back to a total of 32 vessels...sixteen of each. The next two Independence class vessels, USS Montgomery (LCS-8), and USS Gabriel Giffords (LCS-10), are also both building. MODULE CONFIGURATION: The LCS requiremnt was for the vessels to be extremely modular. They were meant to replace several classes of vessels, incuding for Mine Counter Measure (MCM), various aspects of the Oliver Hazard Perry Class guided-missile frigtaes (FFG), and to perform a highly network-centric role in the Littoral spaces covering both anti-surface and anti-submarine warfare. As such, each class comes with a standard armament, and then employs modules to address each major mission as required. The standard armament consists of a high-rate of fire 57mm main gun, either a RAM or SeaRAM short range anti-aircraft missile launcher for self defense, four fifty caliber machine guns for close in defense, and the helicopter pad and hanger. The idea, in theory, is to have an Anti-Submarine Warfare (ASW) module, an Anti-Surface Warfare (ASuW) module, and an Mine Counter Measures (MCM) module to address each major mission area as needed. The plan is for the vessels to be able to return to a forward staging base and swap out modules in a single day as needed. In theory this plan seemed to make sense as small squadrons of LCS vessels could be employed to provide adequate force protection and the capabilities to conduct their mission. The type of force/capability required could be augmented by adding the necessary modules. In the Independence class case, there is actually enough internal space for the vessel to carry an extra module. 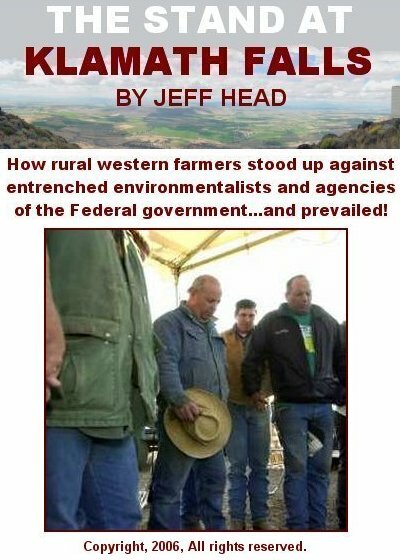 However, in practice this plan has not achieved the desired results or outcomes. The anti-surface package was originally planned to emply the NLOS-LS missile system that was being jointly developed for the US Army and Navy. Due to troubles with the program, that project was cancelled. The NLOS-LS missile was to be a short to medium ranged missile that would be deployed in groups on the LCS with a total of up to 60 missiles. They would have been effective for swarming speed boat attacks, and for very light combatants out to a range of 25 miles. However, with the cancellation of that program, the LCS has been left to use alternate means to fill the gap until a suitable replacement missile is identified. This is being accomplished with the even shorter ranged (6-8 miles) precision-guided AGM-176 Griffen missile (with a small 13 lb warhead). In addition, it is planned to use AGM-114 Hellfire Missiles (air launched range of 8-10 miles) on embarked MH-60R (4 missiles) or MH-60S (eight missiles) helicopter to help address targets at greater range. While both of these methods would prove against small, swarming speedboats or extremly lightly armed opponents, a very significant concern exists concerning what Littoral Combat ships will do in the event that they encounter a larger opposition force (OPFOR) vessel of either the a corvette or light frigate class which are almost universally armed with four or eight long-range anti-surface missiles that far outrange these LCS capabilities. Even modern Missile Boats, or Fast Attack Craft (FAC), who also carry these types of missiles, raise a very significant concern because they would be able to launch against an LCS very far outside of the range that an LCS, as currently armed, could either pre-empt such an attack, or respond to it. In practise, it has also now been found that swapping out of this module is not a single day task. Rather, it appears that it would take three to four days. In the anti-submarine warfare area, the vessels are equipped with a towed, passive sonar array to help locate opposition submarines. But neither vessel is equipped with an active, bow sonar capability. And there are no plans to equip the vessels with short range anti-submarine torpedo or rocket launchers to prosecute any submarine that may get close in to the vessel and pose a threat. While hopefully avoidable, it cannot be ruled out in the littorals that newerr Air Independent Propulsion (AIP) deisel/electric attack subs (SSK) could accomplish this and present a very significant threat to a LCS at close range. Both LCS vessels do have very adequate facilities to house two very strong, MH-60R anti-submarine warfae helicopters, which should be able to themselves detect submarines at range, and then prosecute either those they find or those located by the vessel itself and its towed array. 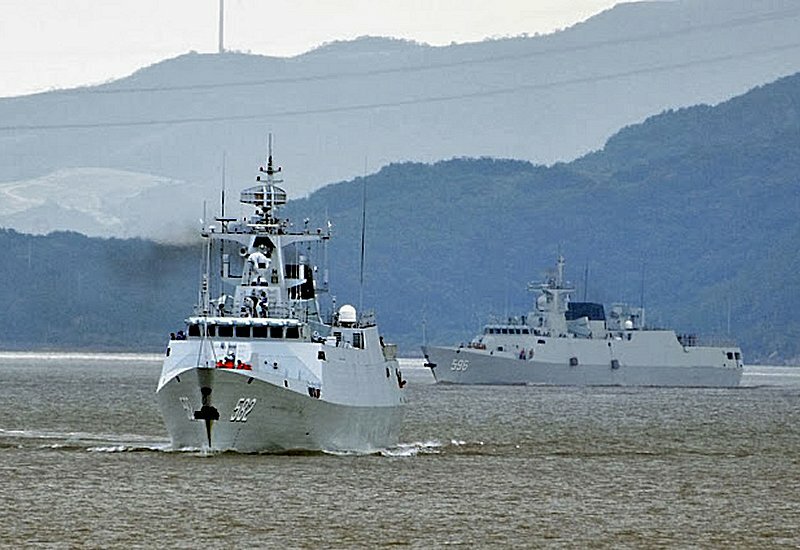 These vessels were meant to be equipped with a sophisticated anti-mine system which would consist of helicopters, unmanned submersibles, direct fire systems, and mine detection equipment that could be towed by the helicopters. In this regard, the Independence class in particular has a large enough landing pad to accomodate the larger MH-53E Sea Dragon helicopters that are specifically designed to perfrom major mine detection and clearing operations. However, in practise, many of these systems and their development and deployment are languishing. The submersibles are not ready, the helicopter towed sled will not work with the smaller helicopters, and the MH-53E helciopters are few in number. In general the development and deployment of these systems is well behind schedule. Right now, medium sized helicopters can be used to help locate mines. Vessel mounted detection systems are progressing, and a helicopter carried, or vessel carried weapon for detroying mines has been developed. As with the anti-surface warfare module, it has also been found that swapping out of this module is not a single day task in any case. Rather, it appears that it willt also take at least several days. These modules are not only behind schedule, they are coming in over buidget as well. 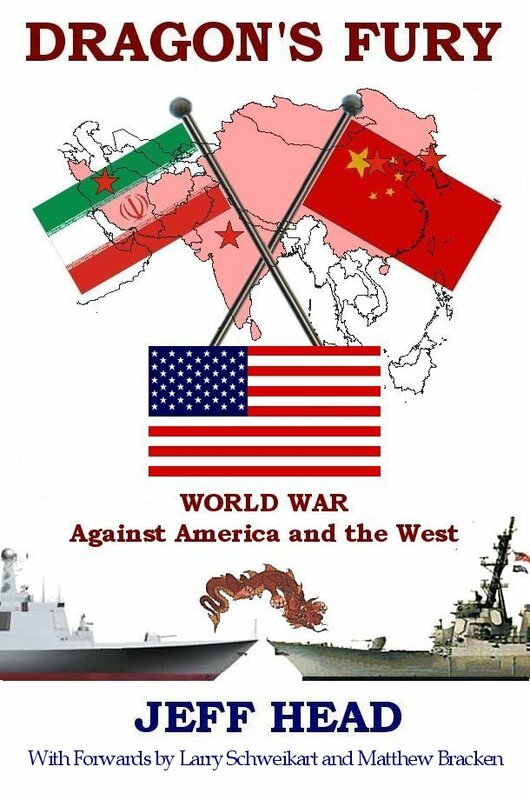 In today's more austere environment, this does not bode well for a program that depends on them to be able to fulfill its specification, particularly when other nations around the world, particularly potential adversaries, are proceeding with plans of their own. In the mean time, other nations are themselves turning their attention to the littoral waters. In some cases (ie. Iran, and perhaps North Korea) the surface warfare portion of those nation's attention does indeed involve large numbers of speed boats. In the case where these vessels themselves have relative short range armament capabilities, the current plans for the modules, aside from them taking longer to swap out than anticipated (which is not a trivial concern), appears to be able to address the swarming speed boats. 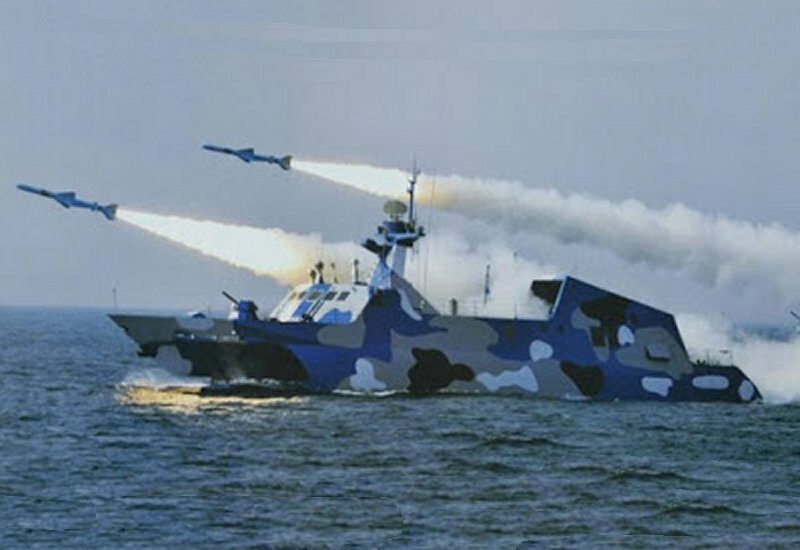 However, more sophisticated and capable potential adversaries are developing and deploying much more capable FACs, with much longer ranged missiles, and (as is certainly the case with Russia and China) they are building corvette and light frigate sized vessels with very significant armament and sensor capabilities, and they are building them in numbers to secure and protect their own Littoral waters. As can be seen, generally, both classes of LCS are larger, they are faster, they have a better sensor and electronic suite, but in each case they are significantly out gunned in terms of anti-surface warfare capabilities. This will remain true even if a new anti-surface missile is developed that meets the original rerquirements of the design, like the NLOSLS missile. Many other nations also deploy corvettes with similar capabilities as those listed here. 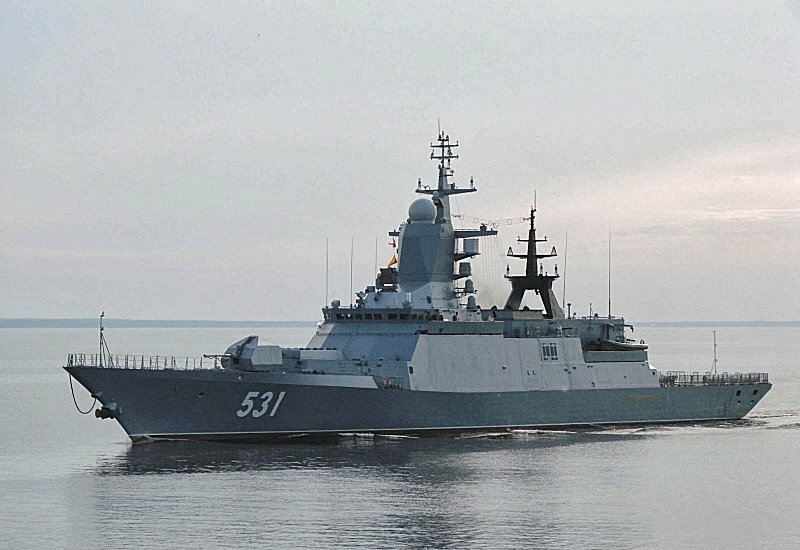 Many times this is older Russian or Soviet equipment, but in most casses those vessels will be armed with anti-surface missile systems that range anywhere from forty, to seventy to one hundred misiles or more. Can we expect our LCS vessels to contend with such vessels when their own missile range is currently on the order of six to eight miles? Of, in the case where their helicopters carry Hellfire missiles, have a range of 8-10 miles from the helicopter? Can we expect those helicopters to fly at great distance from the LCS into a anti-air engagement missile range that exceeeds the range of their Hellfire missiles? Of course, the answer to all of these questions is no...not if we expect our own forces to have a credible chance of dealing with and defeating such an adversary. In any case where a current US Navy LCS vessel were to run up against such an OPFOR vessel, the threat environment and vulnerability would be very high, with a tremdnous risk of either major damage to, or loss of the LCS. 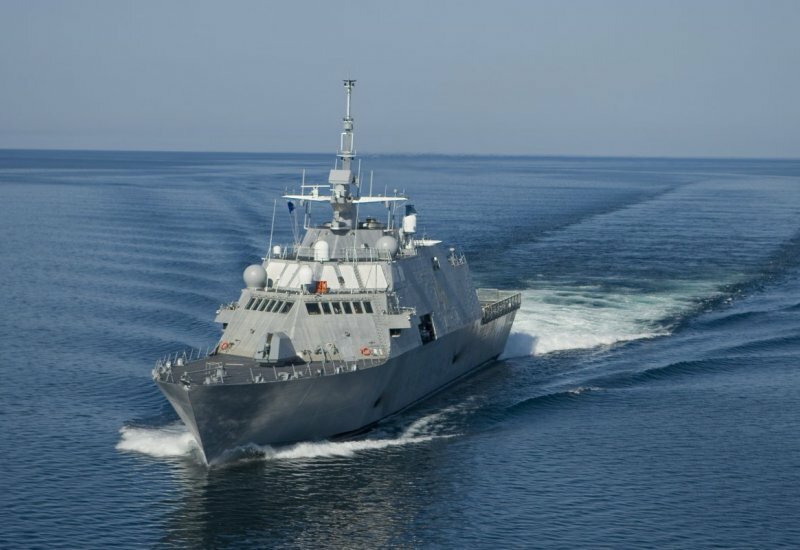 The Secretary of the Navy and the Secretary of Defense recently announced that the US Navy would decrease its build of LCS vessels from 56 to 32. At the same time, it was announced that the US Navy would look to build a multi-role guided-missile frigate that could more appropriately contend in the littorals. In the neam time, improvements to the LCS and a heightened awareness of the vulnerabilyt has been established. This author believes very strongly that the current LCS vessles, as well as their future builds, can be modified to effectively address these vulnerabilities. A short term solution and a longer term solution are necessary as realtively near term developments will help address the issue within a few years. First, in the short term (1-3 years): Add at least one quad-cannister Harpoon launcher (or two dual cannister launchers), with the necessary sensor suoite, to each LCS. The latest block Harppons have ranges well in excess of 100 milies, and are very capanble weapons that would goive each LCS the ability to defend itself and take the surface combat to any agrerssor. In addition to this, each vessel should have a full RAM launcher which carries 21 Rolling ariframe missles. This would require tha tthe SeaRAM on the current Independence class be exchanged for a full RAM system. Second, in the long term (4+ years): Add an 8-cell Mk-41 missile launcher to each LCS. The Harpoon missile launchers mentioned above could then be removed. Add four of the new Long-Range Anti-Surface Missiles (LRASM) into four of these eight cells. This missile has a range out to 250 miles and would be superior to any existing OPFOR threat in the littorals. Then, Quad-Pack ESSM Anti-air missiles into the other four cells of this 8-cell Mk-41 missile launcher. This would provide sixteen sophiticated and very capable anti-aircraft missiles to each vessel, providing each LCS with a layerd defense of sixteen medium range missiles and twenty-one short range missiles. This final measure alone would address the considerable current vulnerabilities for the LCS in surface warfare in the littorals. it would also significantly enhance their anti-air defense capabilites to better defend against any of the more modern missiles that may be launched against them. It would allow the vessels to become much more multi-role, as these new capabilities would be intrinsic to the vessel and not sacrificed by other modules. The ASW capabilities they have with their towed arrays and their ASW helicopters would be able to be conducted at the same time that they have these much stronger ASuW capabilities. Then, for the mine countermeasures role, as needed, particularly Independence class vessels could use the forward staging bases to equip themselves with this module as it is completed, and still have the very much improved anti-surface and anti-submarine protection capabilites. If a swarming threat were envisioned, then the vessels could also add the specifics for that mission module in a similar fashion, without giving up the longer ranged ASuW capabilities, or their ASW capabilities.